In this work, easy and simple structured perovskite solar cells (PSCs) are designed and characterized. Our effort was to reduce the cost of the fabrication of such PSC devices, first by using an inexpensive starting precursor (aqueous methylamine solution) for the perovskite materials and second by design in a PSC structure free of the expensive hole transport layer (HTL). The CH3NH3PbI3 perovskite sols were deposited onto a conductive FTO glass using the spin coating technique followed by heating at 100 °C for 10 min. The structure of the films was characterized by X-ray diffraction (XRD) and their optical properties by UV–VIS spectrophotometry and photoluminescence (PL). The obtained phase confirmed the formation of a tetragonal perovskite structure. Two different solvents have been used, dimethylformamide (DMF) and dimethyl sulfoxide (DMSO). 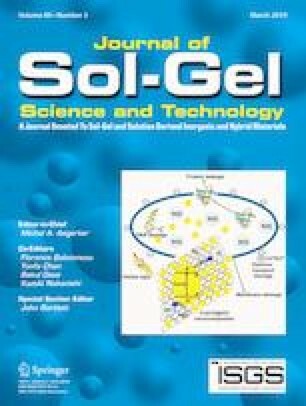 The effect of the type and the concentration of the used solvent DMF and DMSO on the performance of the solar cells have been investigated. It was found that a 40% concentration of the perovskite material resulted in the optimum film thickness that gives the best photoelectric performance. 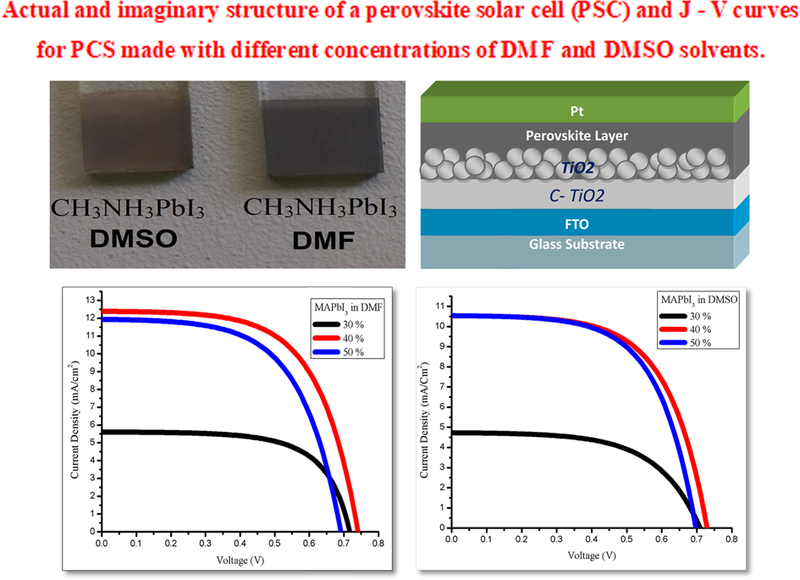 The DMF-based PSC assembled solar cell exhibited the best performance with an open circuit voltage of 750 mV, a photocurrent density of 12.5 mA/cm2, and an overall photon to electric conversion efficiency of 5.7%; all these results are higher than those of cells made with DMSO. Easy and simple structured perovskite solar cells free of the hole transport layer were designed for efficient low-cost organolead halide perovskites solar cells by using inexpensive precursors. The influence of the concentration and the type of the solvent of the obtained perovskite materials on the performance of the solar cell have been investigated. For both the used solvents (DMF and DMSO), it was found that a 40% concentration is the optimum to obtain better performance for the DMF-based PSC. An open circuit voltage of 750 mV, a photocurrent density of 12.5 mA/cm2 with an overall photon to electric conversion efficiency of 5.7% was obtained. This work was supported financially partially by the PHC Al Maqdisi Grant No. 37038WF and the Palestinian German Joint Research Project PALGER2015-34-012. The authors would like to thank Mr. Ahmad Ashour for his assistance in UV–VIS measurements.